In the spirit of the New Year, fresh starts and getting organized. Today, Monday, January 14th, is National Clean Off Your Desk Day. 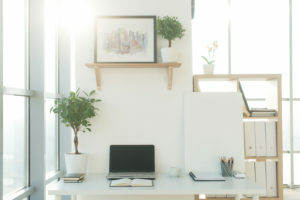 While you de-clutter and tidy up your space, here are five great office ergonomic tips from Riverview Health occupational therapist, Lori Cain. These will help you decrease fatigue, discomfort and physical stress while increasing comfort and productivity. 1. Use good posture. Don’t stretch forward and strain your neck. Instead keep the weight of your head in line with your shoulders. 2. Ensure proper placement. When you continually turn your head to one side it can create imbalances in the neck. For proper placement, make sure your monitor is directly in front of you and your keyboard directly in front of your monitor. This prevents you from craning your head and neck. Your monitor should be no higher than eye level. 3. Avoid eye strain. To protect your eyes, keep your monitor at least an arm’s length away and confirm your work space has enough light. For those who wear glasses, be careful you don’t tip up or down excessively as this can also cause neck strain. 4. Sit in the 90-90-90 position. Your elbows, hips and knees should be bent at a 90-degree angle, with your feet flat on the floor beneath your chair. 5. Be phone friendly. Consider using a phone cradle or headset to avoid putting too much strain on your neck. If you prefer not to use either, place your telephone on your non-dominant side and within reach. This will allow your dominant hand to write easily if necessary.